What you remember when you hear or think of Mumbai ?? Think Think !!! Leave it - Let me tell its "The Famous vada pav". Yes , the vada pav is one of the oldest and very famous road side snack where people in mumbai till today enjoy it to the fullest. What is so much special in it ? It is just a simple pav (Indian pav bread) and batata vada (potato based roundal fritter), still it so famous in Mumbai . No one has the answer. The reason behind the title that the vada pav is hungry saver because people in mumbai are never left empty stomach. If they feel hungry they just love to grab one of these vada pava and cutting chai, makes them full . Earlier around 35 years ago the price of vada pav was told to be 6 paisa. Now the price has gone from 6 paisa to Rs 15 . Till then and now the taste of vada pav has never change but its demand have been increased. Hope its chain of taste never change over coming years too. 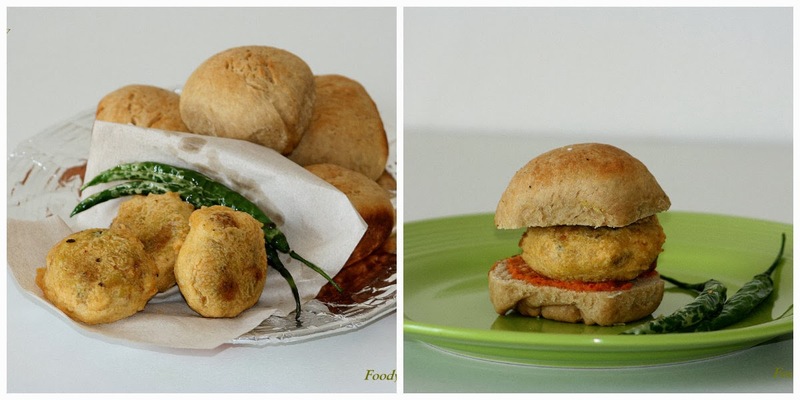 Going on to the recipe , I thought to make vada pav with healthy Whole wheat pav . 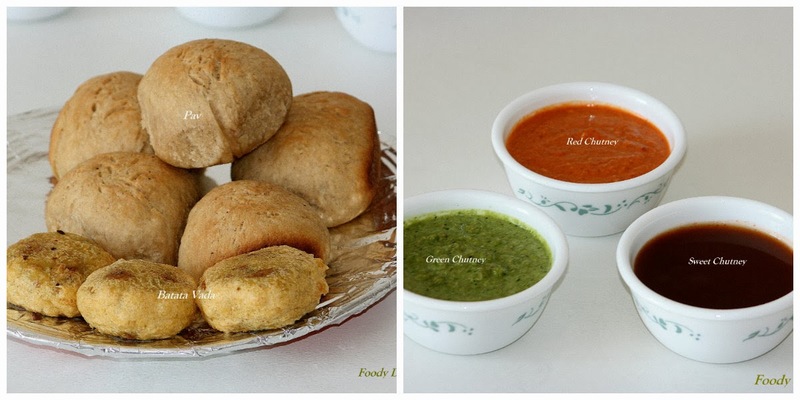 I hope you all will enjoy this superb mumbaikari snack and try out in your kitchen. Combine all the ingredients along with water into the blender and blend to a coarse paste. Boil the potatoes and mashed them thoroughly without any chunks left. Grind green chilies, ginger and garlic to a coarse paste. Place a pan on the medium flame and add oil into it. When oil heats up, add mustards seeds, asafoetida and curry leaves. Sauté for 1 minute till seeds crackles. Add coarse paste of the ingredients and turmeric powder. Fry for another 1 minute. Add in 4 tbsp of water and salt. Mix well. Now add mashed potatoes. Mix well and cook till the mixture forms into dough kind. Switch off the flame. Allow the mixture to cool down. Once the mixture cools down, make the round balls and flatten it a little. To make outer batter. Combine all the ingredients into a bowl and make a semi thick batter by adding required water. Then add oil in the batter and allow the batter to rest at least for 10 minutes to 15 minutes before you start to make batata vada. Then dip each ball into the batter and fry them until they are golden in color. Make sure when you dip the balls into the batter, the balls are fully coated by the batter. Drain all the vada and keep aside. Slit the pav into two halves. Apply red chutney on one half of the pav. On another half, apply green chutney and tamarind chutney. Apply the chutney as much you want. Then place the vada in between the pav and serve immediately with fried green chilies.